Since we aren’t in the office on Sundays, we’d like to wish everyone a belated Happy Mother’s Day! What a wonderful opportunity to recognize all the work that mothers, grandmothers, surrogate mothers, adoptive mothers, foster mothers, and all sorts of caregivers do. It is also a great time to recognize the mothers who are missed or misrepresented in America: trans, queer, undocumented, immigrant, teenage, single, and incarcerated mothers. Let’s also not forget to say a Happy Mother’s Day to those of us who do not have children, but still care for and nurture the people around them. Your love, energy, and strength are what make the world keep moving, and it’s from you that we find the inspiration to make the world a better place. Many social justice and advocacy groups around the country celebrated Mother’s Day with special activism opportunities. The Media Literacy Project, Strong Families, and Thousand Kites worked together to present “Mama’s Day,” a radio show that connected incarcerated moms with their families, friends, and communities. You can listen to the 26 minute program on the campaign’s website. The radio show shared stories and raised awareness about the realities of being incarcerated while being a mom, having a family, or being pregnant. You can visit Birthing Behind Bars and Prison Phone Justice Campaign to learn more. 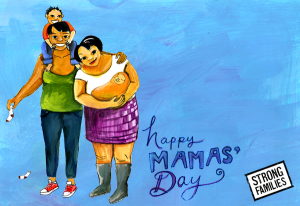 Along with the Mama’s Day programming, Strong Families also ran a “Mama’s Day Our Way” campaign that included special e-cards and a blog series highlighting the many aspects and complexities of motherhood in all of its forms. How did you celebrate? Comment and let us know! This entry was posted in Uncategorized and tagged #Activism, #caregiver, #mothering, #mothers, #social justice. Bookmark the permalink.